“We thought the probability of seeing such interesting features on this satellite of a world at the far edge of our solar system was low,” said Ross Beyer, an affiliate of the New Horizons Geology, Geophysics and Imaging (GGI) team from the SETI Institute and NASA Ames Research Center in Mountain View, California, “but I couldn't be more delighted with what we see!" 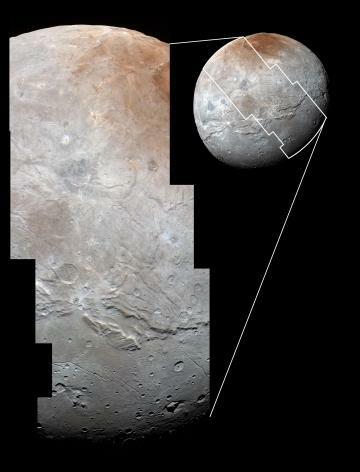 High-resolution images of the Pluto-facing hemisphere of Charon, taken by New Horizons as the spacecraft sped through the Pluto system on July 14, and transmitted to Earth on Sept. 21, reveal details of a belt of fractures and canyons just north of the moon’s equator. This great canyon system stretches across the entire face of Charon, more than a thousand miles, and probably around onto Charon’s far side. Four times as long as the Grand Canyon, and twice as deep in places, these faults and canyons indicate a titanic geological upheaval in Charon’s past. Charon in Enhanced Color: NASA's New Horizons captured this high-resolution enhanced color view of Charon just before closest approach on July 14, 2015. 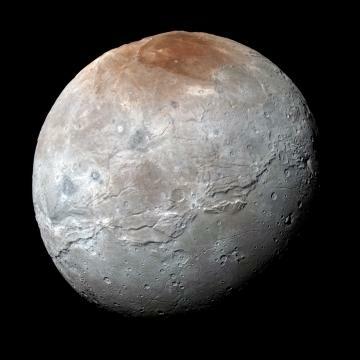 The colors are processed to best highlight the variation of Charon's surface properties. Charon in Detail: Charon's cratered uplands at the top are broken by series of canyons, and replaced on the bottom by the rolling plains of the informally named Vulcan Planum. 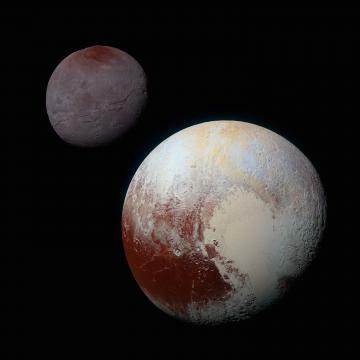 Strikingly Different Worlds: A composite of enhanced color images highlights the striking differences between Pluto and Charon. 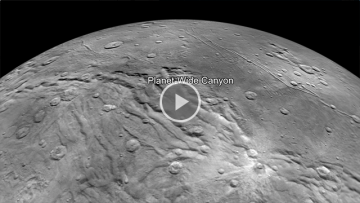 Flying over Charon: Images from NASA's New Horizons spacecraft were used to create this flyover video of Pluto's largest moon, Charon.